Our Slap Yo Daddy meat rub is very versatile and works well on seafood and fish. 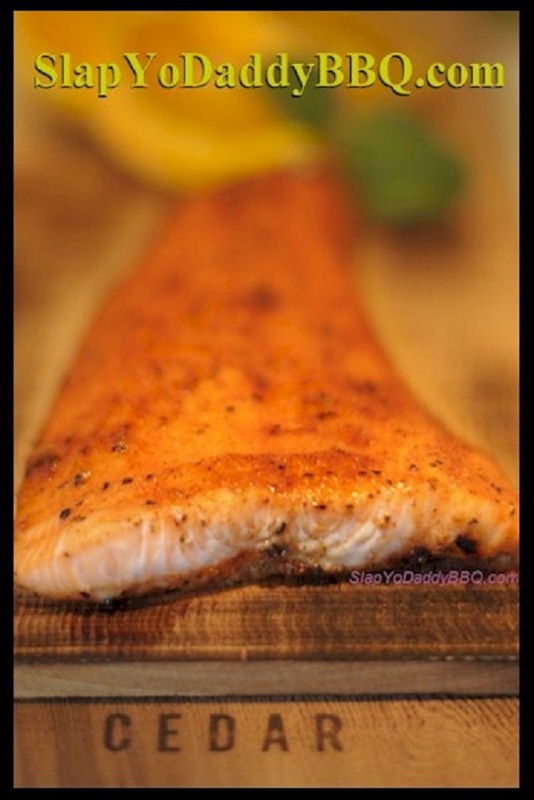 For many years, I’ve thrilled guests with an easy and healthy way to serve a super moist mouth watering salmon roasted on top of a cedar plank. The smoky aroma of the cedar as it chars during the cooking process perfumes the salmon without overpowering the delicate fish which is chock full of healthy Omega-3 oils. This recipe is fast, easy, and delicious! Even if you don’t have a smoker, a cedar plank will work well in an oven. Coat salmon with melted butter. Lay skin side down on cedar plank. some water to douse the flames and move it to a cooler spot on your grill. minutes on my grill depending on the thickness of the filet. pepper into a stick of butter. Spread the butter on top and watch it melt all over your salmon.